Training for and completing in 2012 the notoriously tough multi-stage race the Marathon des Sables was a catalyst for change. After my first marathon in the late 1990s I swore never to do another again . . . but the next one soon appeared. By the mid-2000s I’d completed three Ironman triathlons, run 81 miles around a 400-metre running track in the Doncaster 24 Hour Track Race and ran a few editions of the George Littlewood 6 Hour Track Challenge. And a few more marathons along the way. I was never going to challenge the front runners: getting out to simply run was more important. But working life and commuting took up more and more of my time. My last Ironman triathlon in 2005 was a bit of a mess but exhausted and injured I still finished. Four years of inactivity later I was the heaviest I’d ever been at over 16 stone: tired, overweight, regularly ill, and not yet 40 . . . I knew if something didn’t change the shadows of such a life would begin to cast darker: how much more weight would pile on? when would diabetes arrive? or worse? Working hard was always important to me but the balance of playing hard too was no longer there. So in 2009 I signed up to run the 2012 edition of the Marathon des Sables in an effort to run for a little longer away from those encroaching shadows: 153 miles in six stages across the endless sand dunes and mountains of the Moroccan Sahara in temperatures that hit 52 degrees centigrade. Returning home after a cathartic seven days I resolved to do two things: firstly, to change my career and focus instead on something far more interesting and, secondly, to build back into my life the enjoyment of simply running. The aim of finishing 100 marathons and exploring challenging environments across the planet by running other extreme footraces in remote deserts and jungles had now become possibilities I could accept. 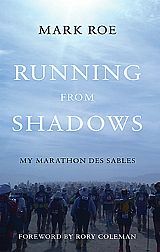 This website follows on from my book, Running from Shadows – My Marathon des Sables. With a Foreword by multiple Marathon des Sables finisher, performance coach and holder of 9 Guinness World Records, Rory Coleman, it was published in 2014 and recounts the build up to and each gruelling day of that 153 mile event. The overarching premise of the book and this website is simple: you can achieve extraordinary, enjoyable things. The only thing stopping you, is you . . .